Violins, Violas, and Cellos based on 40 years of research on Stradivari, Guarneris, and Amatis. At Nagyvary Violins, we make the most authentic recreations of the old Stradivarius and Guarnerius violins. Each note is played many times into a computer-based signal analyzer which provides a fingerprint of the sound (FFT power spectra). Unless this fingerprint resembles those of the fine Stradivari and Guarneri violins, the new violin will be reworked. Christian Science Monitor: Stradivarius: Artisan or accident? Listen ... Can You Tell? Is it a Stradivari or a Nagyvary? Download any of these sets of MP3 files and you decide. See How to Buy for information on ordering your own World Class Violin, Viola, or Cello. 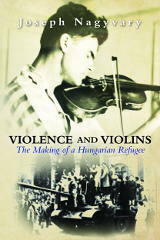 Violence and Violins - The Making of a Hungarian Refugee. Get the new book by Dr. Joseph Nagyvary. Identifying strengths and weaknesses... A sound analysis system is the most reliable learning tool for improvement of tone quality. Dr. Nagyvary... At the interface of arts and sciences.